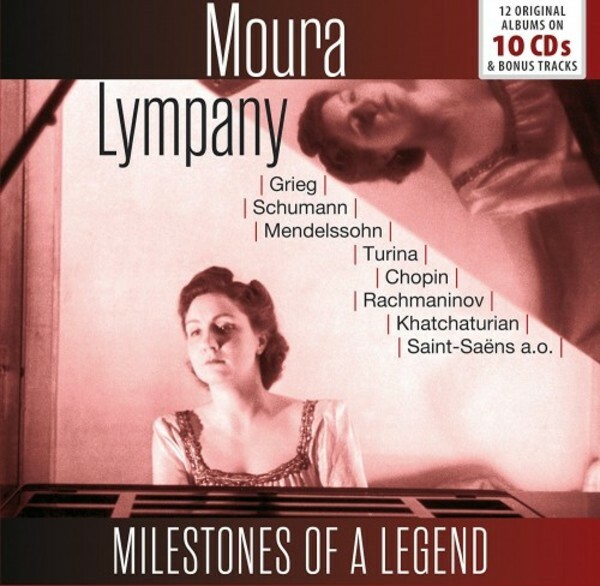 The pianist Moura Lympany, born in Cornwall, England, thoroughly shook up the worldwide piano-scene in the 1950s. Critics attested her elegance and wit, praised her poetic touch and the varied qualities of her pianist barometer, whose scale ranged from velvety charm to burning fireworks. These are outstanding examples from the history of recorded music, excellent specimens of her interpretive art, which enabled her to meet any and every challenge. In addition to the highly acclaimed recordings of Chopin�s 24 Pr�ludes as well as other compositions for piano solo and Khachaturian�s D major Concerto, there are her recordings of the Rachmaninov Pr�ludes, his Third Piano Concerto and the Second Piano Concerto of Saint-Sa�ns (with Martinon), all of which can always be found in the international listings of the best-ever-recordings of the respective repertoire. Bonus recordings with works by Brahms, Liszt, Litolff, Debussy and Chopin complete this acoustic portrait of this extraordinary artist.